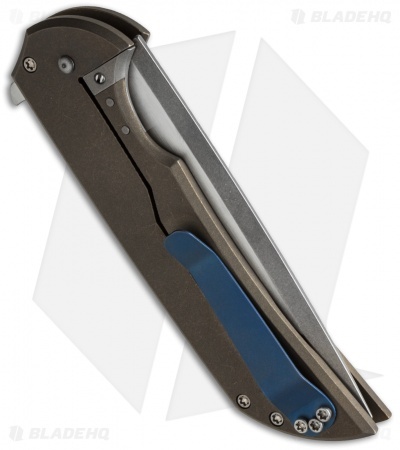 The Mordax flipper is one of the latest 'Entry Level' knives from Ferrum Forge. This one has a milled face, bronze anodized titanium handle with a blue anodized pivot, pocket clip and barrel spacers. The full length swedge drop point blade is Bohler N690 steel with a two-tone stonewash/satin finish and flipper opener. The Mordax is outfitted with a steel lock insert/internal overtravel arrestor, H.R.D. (Hoback Rolling Detent), and caged thrust bearings. Ferrum Forge Knife Works make a relatively small number of unique, highly sought after knives. In an effort to satisfy the demand for their fine folders they've created the "Entry Level" lineup. 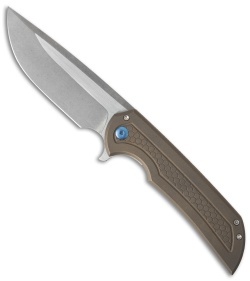 Generally, it's a less customized version in a limited run of 200 knives. Lest you misunderstand, these knives are anything but entry level; each one is a bona fide rock-star-of-a-knife with an exquisite build and high tolerances.